I'm a doodler from way back. When I was a teen I doodled and doodled all over everything. I recently saw a report on CBS Sunday morning about doodling and doodlers. Apparently research shows that it helps us focus and work through difficult issues. Hmmmm. It engages the mind to allow us to think. "Think about a mindless drawing as a way to take all of those things that distract you, all of those subjects that you ruminate on, and clearing them away and opening this space where information can get in. 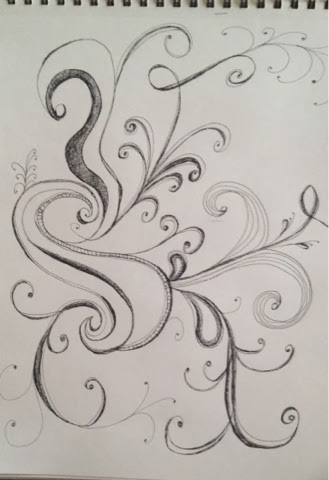 Doodling is the attentional sweet spot." Well, sign me UP! Let's clear out my little tee tiny brain!! I pulled up my Pinterest app and found many cool doodles. I snapped pictures of the most interesting ones that considered replicating. I pulled out my large drawing pad and I glanced back and forth at the photo that I had copied on my phone. I tried to make the exact drawing but I was struggling. It didn't look the same! I wanted it to look and be the SAME! This seemed FORCED. The more I tried to make the curves and squiggles look like the photograph, the more it looked absurd and the more frustrated I became. Then I did something that even surprised me-- I grabbed my big rubber eraser and erased it all! I thought-- if I'm going to doodle, I'm going to do it my way! It was impossible to COPY a doodle. The purpose of doodling is to be free flowing, NOT structured. So I began drawing independently. Squiggles and curls. Shading smidgens here and there. Eventually I had enough confidence to put pen on to the paper and not use pencil. It began to feel natural and relaxing. It was MINE.... Not a copy. Is it a masterpiece? Hardly!! Wouldn't it be nice to have an answer to the question that I repetitively asked EVERYONE in the early years.... "What can we DO to get out of this horrible place?! How do we go on and relearn how to LIVE again?!" I needed to do SOMETHING to make it better. The answer isn't simple -- and you've heard me state this multiple times. You must learn to redefine normal. For you and your family. You will redefine normal.... Whether you purposely do this or not. How this occurs is different for each of us. Individual. Just like a doodle. My doodle is NOT perfect. It's off centered and I didn't follow the rules. But it fit my needs when I did it. We each have our own path... But there is hope for a future in the darkness. THIS I promise, my dear friends. I have had writers block for the past couple of months. I keep thinking-- "is there anything I can republish?!" In the past few weeks I have been in contact with three new mamas who have joined our club-- the truth is-- what I am currently experiencing isn't what the newly grieving mama is experiencing. Not even close. I firmly believe in the words I say to other grievers: "where you are now, you will not always be." I recently found an obscure email that I sent to a mother who just lost her son. This letter was written only seven months after Logan's death. It was still very EARLY in my grief. I no longer see and feel that grief is a lifestyle... Although you could never have told me that then!! This letter is interesting to me -- how much I have changed. Now that I have journeyed to a different place in my life, I'm thankful for days of sunshine. In the following letter, I reference the book Grieving Forward by Susan Duke. Hugs to each person out there in this big old world who feels the pain and emptiness of grief. May you feel comfort. Please know that I welcome and cherish every email. I am so very sorry to hear about the very tragic loss of your son. So many things in life change when a child dies and it is so hard to keep going. I lost my 17 year old son in July after he had his tonsils removed. The trauma and drama of his death... the process of him dying and telling our children and family... are played in my mind everyday constantly. I only know how our family has felt and how we are trying to stay afloat. Grief is such a strange thing. It is not quick and it is not an event, but instead I feel, right now, that it is more of a lifestyle... the big pink elephant in the room. It is bizarre to watch how people react in front of the grieving. At first so helpful and consoling and then to become afraid to speak my beloved Logan’s name. When I speak of my dead child, sometimes the room freezes and people do not know what to say. I have a painful longing for my Logan and I sometimes cannot stay focused. We don’t even have a name... at least when a husband or wife loses their partner, they are called "widows" or "widower." Our grief is so close to home for people... everyone’s greatest fear... that society has not even given us a name. Time has moved so slowly for me. I feel like every work day lasts about 20 hours, especially when we are not busy, and every evening lasts 10 hours. I have been guilty of driving around town to avoid going home. Home is where I have missed my child the most. While at home, we have struggled to know what to talk about any more, even as a parent to talk to our children. What did we talk about "before?" Everything has been marked "before" and "after." The exhaustion of trying to go forward... going to work.... going to school events.... even getting up and getting dressed deserves a pat on the back. But they don’t know that. We now belong to the club that no one wants to be in. We are living everyone’s greatest fear. It wasn’t until recently, our six month anniversary, that I have realized that more has been lost than just my son... just to name a few - satisfaction in my job, my comfort in my other two children (where they are - I become nervous when they are not with me.) When you sit and ponder, you will probably have your own list of what you have lost. So after these happy notes, I want to tell you what has helped me. Actually, getting up everyday has helped. Praying. Turning off the TV and playing a family game like cards has helped us reconnect to our daughter. Antidepressants have made it possible for me to see the future. Yoga, not in a class but at home in front of the TV helps to stretch and relax. Sleeping medications have made it possible to get up in the morning and work all day. Going to bed at absurd hours, like 7:30PM some days has made me physically feel better. Reflecting on my many happy memories of my child. I read somewhere to "fake it till you make it" and I believe that has helped. I have my work face... like a game face. Most importantly, I feel great comfort in knowing that Logan is in safe hands in the Kingdom of Heaven. I know that I will see him again one day. I had someone pull me aside and suggest a truly helpful book that I have sent to you. I connected immediately to the person that wrote the book. Her faith in our God has helped me to realize that God did not create this horrible situation that we have been thrown into. I believe that I have begun to "Grieve Forward." I went through the book and I have highlighted the parts that have touched my heart. What I found was that I could only go as far in the book as I have been in my grief. I was not able to finish the book until recently. In this book, one of my favorite sayings, at the beginning, is "It’s hard to see God’s perspective when your heart has been plowed by pain. But broken fields are where seeds of hope grow best. As they grow, one day you will realize that your sorrow has not escaped God’s watchful eyes - and that "heart-shattered lives ready for love/ don’t for a moment escape God’s notice." (Pg 43) I know that my heart has been plowed by pain and I am beginning to feel the seeds of hope. "You are consumed with grief in the early stages, and other people just don’t want to be around it. If they only knew how much is learned on the threshing floor of grief - the place where wheat is crushed in order to separate the insignificant stalks from the treasured grain - they would see that grief takes you to the deep places of your heart, and that all the changes occurring in your life are not bad. In fact they might catch a glimpse of grace in its purest form, and sacred love unveiled. At first, you may not feel comfortable with change, but in time, you’ll realized how much grief has seasoned you." (pg 66) The quiet time that I have, like it or not, has made me have time for reflection. I didn’t want to be seasoned... but I am now feeling more of a sense of peace and purpose. The fog will last for quite sometime, but will begin to lift. Time and going through the grieving process does make the light start to come back into your life again. But as you will notice, grief is like the tide, it will roll in and it will roll out. Remember that LOVE IS--not was. That your precious child is with you every day and he will always be a part of your present and your future. Love is the one thing we take with us and the one thing we leave behind. It is more powerful than death.